Disclosures: Consultant and speaker for Cordis, a Cardinal Health company. Disclosures: Consultant and speaker for Cordis, a Cardinal Health company; consultant to Teleflex. A 72-year-old African American man with a medical history significant for hypertension, hyperlipidemia, and borderline diabetes developed sudden and acute onset of midsternal chest pressure without radiation at 10:00 PM on the evening prior to presentation. His chest pressure was associated with diaphoresis as well as nausea and light-headedness. He finally called 911 at 1:10 AM and was brought to the emergency department. The initial electrocardiogram showed sinus bradycardia with a first-degree atrioventricular block and inferior T-wave inversions. His pain resolved with intravenous heparin and sublingual nitroglycerin, and his troponin I level was 1.49 ng/mL. The following morning, the patient developed further chest pain and was therefore urgently brought to the cardiac catheterization laboratory for coronary angiography. The patient underwent diagnostic catheterization from the right radial artery. A 5-F hydrophilic Glidesheath™ (Terumo Interventional Systems) was placed without any complications. He had significant subclavian tortuosity, as illustrated by the course of the angled Glidewire® (Terumo Interventional Systems) (Figure 1). A 5-F diagnostic Judkins left 4 catheter was used to engage the left main artery. A 5-F Judkins right 4 (JR 4) catheter was used to engage the ostium of the right coronary artery (RCA). There was difficulty in torqueing the right coronary catheter, which is not uncommon in cases of extreme subclavian tortuosity. Usually, having the patient take in a deep breath will help straighten out the tortuosity enough that one can transmit the clockwise torque to the end of the catheter. 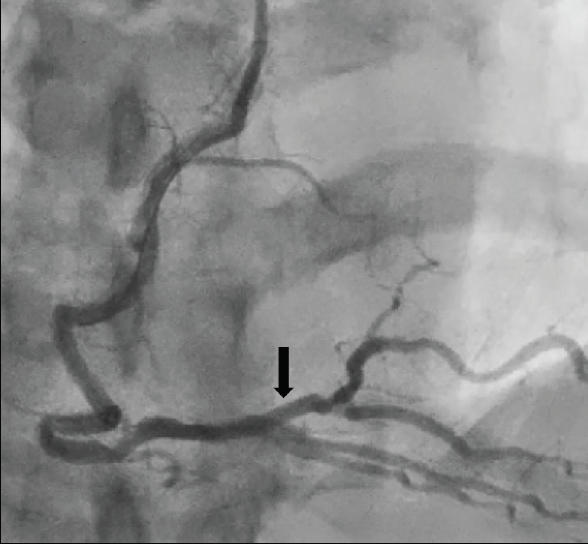 Diagnostic angiography revealed a high-grade, 80% proximal left anterior descending (LAD) artery lesion (Figure 2) and a circumflex artery with nonobstructive disease. Additionally, the RCA had an anterior takeoff with a mild shepherd crook, and the mid-RCA was 100% occluded (Figure 3) with left-to-right collaterals. Given the patient’s clinical history, this most likely represented a subacute occlusion that resulted in an acute coronary syndrome without ST elevations on the electrocardiogram due to the development of right-to-left collaterals. Percutaneous coronary intervention (PCI) was planned for the RCA. A 6-F Amplatz left (AL) 1 guiding catheter with side holes was selected. Once in the ascending aorta, we used the back end of a standard 0.035-inch J-tipped wire through a Tuohy-Borst adapter and had the patient take a deep breath in order to transmit the necessary torque and engage the ostium of the RCA. With the wire in the guide through a Tuohy-Borst, we were able to test and determine our proximity to the ostium of the RCA. Once engaged, we used a balance middleweight wire to wire into the mid-RCA. 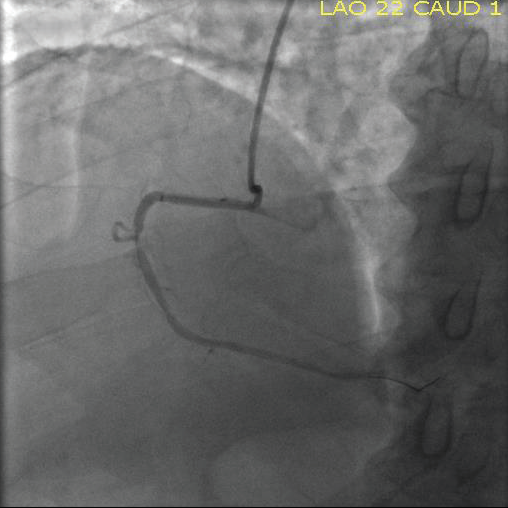 There was not enough support to advance the wire into the distal vessel given the anterior takeoff of the RCA. Therefore, we used a 2.5- X 8-mm Emerge™ monorail dilatation catheter (Boston Scientific Corporation), which allowed us enough backup support to push our wire into the distal RCA. We predilated with this balloon at the site of occlusion and then used a Guidezilla™ II guide extension catheter (Boston Scientific Corporation) to provide support for our stents (Figure 4). We treated a more distal lesion with a 3- X 12-mm EluNIR™ drug-eluting stent (DES; Medinol Ltd., distributed by Cordis, a Cardinal Health company) and the more proximal of the mid-RCA lesions with a 3.5- X 15-mm EluNIR™ DES. Both stents were postdilated to high pressure with a 3.5- X 8-mm NC Emerge™ dilatation catheter (Boston Scientific Corporation), resulting in an excellent final result (Figure 5). Figure 4. The Guidezilla™ II catheter in the proximal RCA. Figure 5. Final PCI result in the RCA. Figure 6. Final PCI result in the LAD. The patient returned the following week; underwent imaging of the RCA stents, which were widely patent; and then had stenting of his proximal LAD with a 3- X 28-mm EluNIR™ DES with an excellent result (Figure 6). The patient has been doing well and is free of angina. Subclavian tortuosity can be a challenge when performing transradial catheterizations. There are several tricks that can improve one’s chances of a successful diagnostic catheterization and PCI, if necessary. First, the vast majority of subclavian tortuosity can be dealt with by having the patient take a deep breath and hold it. This reduces the amount of tortuosity, thereby allowing one to torque the catheter. If this maneuver does not allow for enough transmission of torque, then placing the stiff back end of a 0.035-inch wire into the diagnostic catheter (of course avoiding coming out of the catheter) paired with a deep breath will usually be enough to allow one to manipulate the catheter into its intended location and prevent the diagnostic catheter from kinking. In addition, Optitorque® catheters (Terumo Interventional Systems), specifically the Tiger and Jacky shapes, are stiffer than standard Judkins catheters and seem to better transmit torque in these challenging cases. If the case goes into a PCI, then placing the stiff back end of the 0.035-inch wire through the Tuohy-Borst adapter and flushing allows one to not only transmit the torque, but also test to determine the location of the ostia. The combination of these techniques can overcome the vast majority of subclavian tortuosity. If the maneuvers described are not successful, one can always explore radial artery access on the other side. This case highlights the fact that subclavian tortuosity presents a major challenge during transradial diagnostic cardiac catheterization and PCI. The anterior takeoff of the RCA and tortuous shepherd crook anatomy also make it difficult to deliver guidewires and interventional equipment into the artery. In this case, the operator chose an AL 1 guide to engage the anterior takeoff of the RCA because the AL 1 has the length to reach an anterior origin and provides excellent support to treat tortuous or distal segments of the RCA. When using an AL 1 guide to engage the RCA, care must be taken because the AL 1 tends to deep-seat the RCA, which can lead to proximal artery dissection. Despite the supportive AL 1 guide, proximal RCA tortuosity necessitated the use of a 6-F Guidezilla™ guide extender to facilitate balloon and stent delivery. Guide extenders such as the GuideLiner® (Teleflex) and Guidezilla™ are transformative interventional tools that dramatically increase guide catheter support, enabling successful completion of highly complex PCI cases from a radial access point. In addition, 7- and 8-F radial access is now common in high-volume radial centers where atherectomy, bifurcation, and chronic total occlusion PCIs are routinely performed transradially. In the current era, advanced radial techniques and radial specific equipment have facilitated increased adoption of transradial and complex transradial PCI in the United States. A 56-year-old man with a history of coronary artery disease was admitted through the emergency department with 2 weeks of worsening exertional chest pain and near-syncope. He had a past medical history of hypertension, hyperlipidemia, obesity, and coronary artery stenting. In 2015, he was treated for exertional angina with extensive reconstruction of his RCA with five overlapping Promus Premier™ DESs (3.5 X 12 mm, 3 X 20 mm, 3 X 16 mm, 3 X 20 mm, 2.25 X 12 mm; Boston Scientific Corporation). Presumably, short stent lengths were used to facilitate stent delivery through the highly tortuous artery. The electrocardiogram obtained at admission was normal, and there was no evidence of ischemic ST-segment abnormalities. Serial cardiovascular biomarker testing showed three troponin values in the normal range. The patient was referred for inpatient stress testing where he exercised for 8 minutes on a Bruce protocol treadmill test and stopped due to typical angina. His electrocardiogram showed 1 mm of ST depressions in leads II and III and aVF that resolved 3 minutes into recovery. Nuclear imaging demonstrated normal left ventricular function and a reversible perfusion defect in the RCA territory. 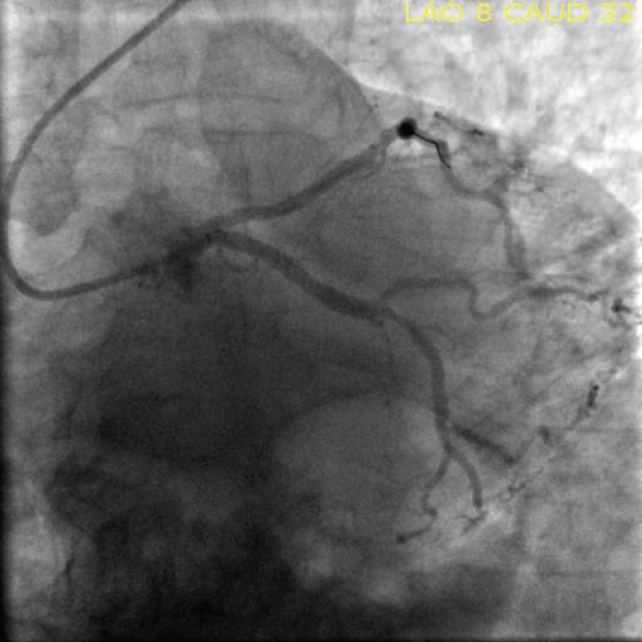 The patient was sent for coronary angiography and possible treatment of obstructive coronary artery disease. Coronary angiography was performed from the right radial artery using a 6-F Glidesheath™ Slender (Terumo Interventional Systems) and 5-F diagnostic catheters. Angiography of the left coronary system demonstrated luminal irregularities but no obstructive stenoses. The RCA was a super dominant system with severe tortuosity. The mid-RCA had a 90° turn followed by a 180° hairpin turn, and the artery was lined with five overlapping DESs, spanning from the ostium to the distal artery. The culprit stenosis was a 90% distal stent edge restenotic area in the right posterolateral branch ostium just after the bifurcation of the right posterior descending artery and right posterolateral artery (Figure 1). 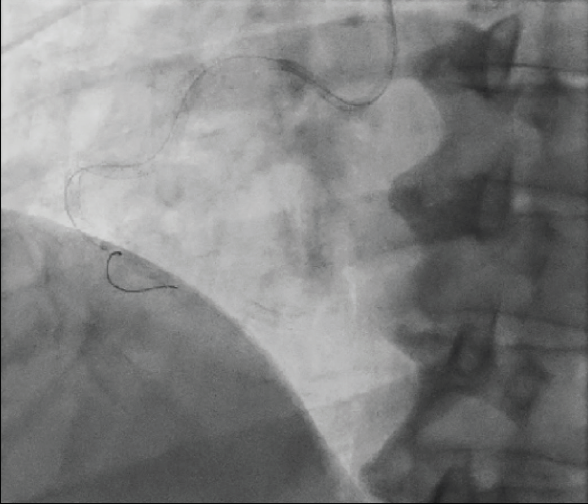 Based on the patient’s symptoms, stress test, and angiogram, the plan was to proceed with PCI of the distal RCA. Figure 1. 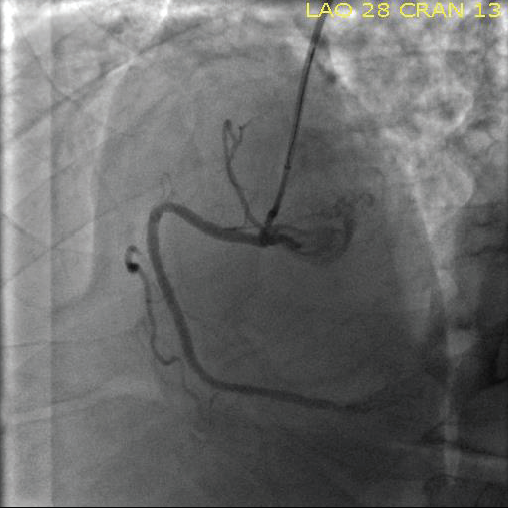 RCA diagnostic angiography showing extreme tortuosity in an extensively stented artery. Distal culprit stenosis at the posterolateral ventricular branch ostium (arrow). Figure 2. Attempt at delivering an Asahi Prowater wire to the distal RCA. We anticipated difficulty delivering balloons and stents through the tortuous RCA, which was already lined with stents. We considered upsizing to a 7-F radial system but opted to utilize a 6-F AL 0.75 guide catheter to provide extra support. The vessel was wired with some difficulty. Initially, we advanced an Asahi Prowater wire (Asahi Intecc USA, Inc.) to the mid-RCA, where it stalled despite being supported by a 1.5-mm over-the-wire balloon (Figure 2). We switched to a Finecross® microcatheter (Terumo Interventional Systems) and Asahi Sion Blue high-torque wire (Asahi Intecc USA, Inc.) and successfully delivered the wire to the distal right posterolateral branch. It was extremely challenging to deliver balloons past the mid-RCA, so we utilized a GuideLiner® guide extender to provide additional support. The GuideLiner® is a coaxial catheter extension delivered through a standard guiding catheter via a monorail push tube. We advanced the 6-F GuideLiner® to the mid-RCA over the shaft of a 2- X 8-mm compliant balloon. The GuideLiner® would not traverse the initial bend in the proximal RCA; however, with the proximal GuideLiner® support, we delivered the 2-mm balloon into the distal artery and adequately predilated the culprit stenosis. To deliver a stent to the treatment area, we needed to advance the GuideLiner® into the midportion of the RCA. Deep vessel delivery of the GuideLiner® can be facilitated by balloon inflation in the distal artery during GuideLiner® advancement (balloon anchoring technique). 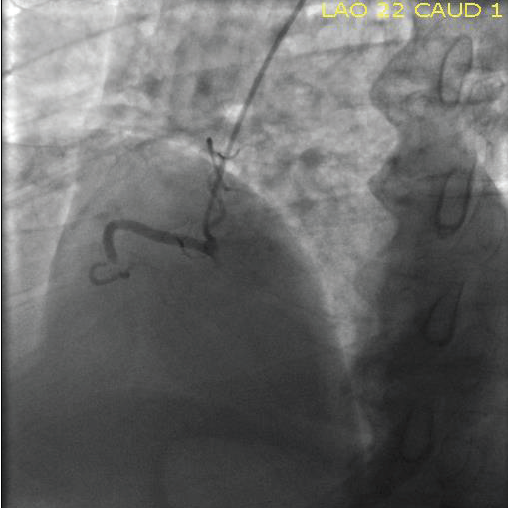 In this case, despite distal inflation of the anchoring balloon, the GuideLiner® would not advance. 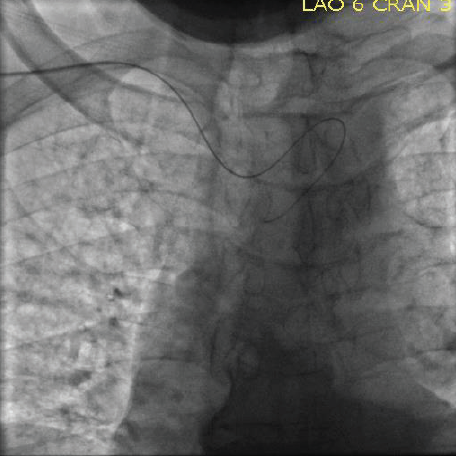 We thus employed a technique wherein we inflated a 3- X 15-mm compliant balloon at low pressure at the tortuous site in the mid-RCA where the GuideLiner® stalled (Figure 3A). After inflation of the balloon at the tip of the GuideLiner®, we slowly deflated the balloon while simultaneously advancing the GuideLiner® deeper into the RCA. This “inchworming” technique centers the GuideLiner® in the artery and effectively creates an obturator that enables the GuideLiner® to travel through resistant or tortuous segments. After serial low-pressure inchworm inflations and GuideLiner® advancement, we placed the GuideLiner® in the mid-RCA. Figure 3. Balloon-assisted GuideLiner® tracking and GuideLiner® advancement to the mid-RCA (A). GuideLiner®-assisted delivery of a 3- X 12-mm EluNIR™ stent to the distal RCA culprit stenosis (arrow indicates the GuideLiner® tip) (B). Figure 4. Final angiographic result after placement and postdilation of a 3-mm EluNIR™ stent (arrow). With this aggressive GuideLiner® support, we successfully delivered a 3- X 12-mm EluNIR™ DES into the distal culprit right posterolateral branch stenosis and deployed the stent with 15 atm of pressure (Figure 3B). The stent provisionally jailed the posterior descending artery. We postdilated the stent with two high-pressure balloon inflations (3-mm Mozec™ NC balloon [Cordis, a Cardinal Health company, manufactured by Meril Life Sciences Pvt. Ltd.] at 18 atm), and the final angiographic result was excellent (Figure 4). The stent-jailed posterior descending artery remained widely patent after the postdilation of the posterolateral branch. The patient tolerated the procedure and was discharged the following day. Extreme coronary artery tortuosity complicates PCI and decreases procedural success by impeding the delivery of wires, balloons, and stents into the target stenosis. Tortuosity also increases the risk of procedural complications by increasing the rate of dissection, stent loss, and acute closure.3 In this case, the combination of severe tortuosity and vessel rigidity from the previously placed five overlapping stents created a situation where it was extremely challenging to deliver wires, balloons, and stents to the distal RCA stenosis. In cases of extreme tortuosity, the choice of radial versus femoral access, guide catheter shape, and catheter French size all affect the amount of backup force present to support delivery of PCI equipment. In many cases, femoral access provides better backup compared to radial access, but this comes with an increased risk of access site bleeding. Utilization of long femoral sheaths (up to 45 cm) can further augment guide backup in cases that require extra support. Guide catheter French size is another major determinant of guide support, with a near doubling of the gram force backup when increasing from a 6-F to an 8-F guiding catheter system. Guide extenders such as the GuideLiner® and Guidezilla™ are transformative tools that have been widely adopted to support radial, complex, and chronic total occlusion PCI. These guide extenders provide active backup support when they are delivered deep into the target vessel. 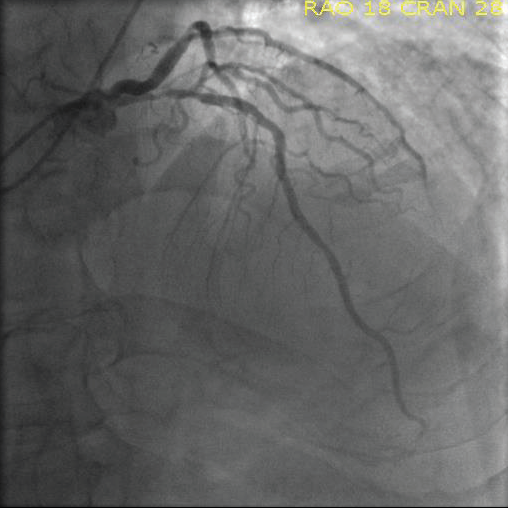 In our case, we favored PCI from the right radial access site that was used for the diagnostic angiography. We chose a 6-F AL 0.75 guide because the AL shape provides excellent support in the RCA. Alternatively, upsizing to a 7-F radial system or a 7.5-F sheathless radial guide would certainly be reasonable considering the anticipated difficulty delivering the stent into the distal RCA. Recently, 7-F radial sheathed and 7.5- and 8-F radial sheathless systems are being used with increasing frequency in complex and chronic total occlusion PCI. In addition, there are several new 7- and 8-F sheathed and sheathless guide systems coming to market to support complex radial PCI. Even with the backup support of the AL 0.75, it was challenging to deliver balloons past the mid-RCA. We therefore utilized a 6-F GuideLiner® and a combination of the balloon anchoring technique, inchworming, and balloon-assisted GuideLiner® tracking to deliver the GuideLiner® into the mid-RCA. With the excellent support of the mid-RCA GuideLiner®, we successfully stented the distal RCA culprit stenosis, achieving an excellent angiographic result. Dr. Croce and his team should be commended on an excellent result from a very difficult, tortuous RCA with previously placed stents. When faced with a challenging case like the one presented by Dr. Croce, many operators would consider converting to a femoral approach or upsizing their guiding catheter for greater support. Neither of these is necessary with the equipment and techniques available today. In this case, the decision was made to choose a more supportive, passive guiding catheter (AL 0.75). Although one would think this passive support guiding catheter is better than a JR 4, the ability to deep seat the JR 4 with the guide extender may add additional support that the AL 0.75 cannot provide (Figure 3B, notice the location of the AL 0.75 guide). In addition, often times it is necessary to "walk" the guide extender into the distal vessel, as was done in this case. When dealing with a native vessel, this balloon-injured area usually necessitates stenting afterward, but fortunately, the vessel in this case had been stented from a previous procedure. Since this was an ad hoc PCI, the procedure was performed from a right radial approach following the diagnostic catheterization. If one were planning this PCI, the left radial approach often provides greater support for the right coronary artery and the ability to more easily deep seat the JR 4 guide. 1. HEARTRAIL® III Guiding Catheter. Terumo Interventional Systems Web site. http://www.terumois.com/products/catheters/heartrail.html. Accessed December 12, 2018. 2. Sheathless Eaucath. Asahi Intecc Web site. http://asahi-inteccusa-medical.com/medical-product/sheathless-eaucath. Accessed December 5, 2018. 3. Li Y, Shen C, Ji Y, et al. Clinical implication of coronary tortuosity in patients with coronary artery disease. PloS One. 2011;6:e24232.